Diaskari beach (Παραλία Διασκάρι), also known as Green Beach, you will find less than 30 km east of Ierapetra. If you spend your holiday in Makry Gialos, you can easily go there on foot, because it is less than 3 km from this holiday resort. This quiet beach with a small and simple tavern is a good way to spend a relaxing day away from more crowded places. Diaskari is a little known and not very popular beach, which will appeal to people who are looking for more secluded somewhat wild places. This does not mean that the beach is small, just the opposite. Its length is about 350 meters. The beach is covered with thick sand and small pebbles washed by crystal clear water. When entering the sea, however, you need to show vigilance because the descent is lined with slippery, stone slabs on which it is easy to slip. Larger dimensions of the beach mean that, apart from the relatively small organized part, there is a lot of room for those seeking seclusion on the east side. Often the sympathizers of natureism also use this piece of beach. Diaskari is also not overloaded with beach infrastructure, you will not find several rows of sun loungers here. For the price of 8 € you can only rent a so-called kiosk, that is, two sun loungers under a straw canopy. 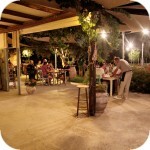 Near the part, just off the asphalt road leading from Makry Gialos, there is also a small tavern. You can eat several freshly prepared Greek delicacies (eg okra in tomatoes) and make small purchases in a mini-market.